Cast: Laura Linney, Tom Wilkinson, Jennifer Carpenter, Campbell Scott. Story: An exorcism goes wrong and ends up in the law courts. The Exorcism of Emily Rose is a courtroom horror - and you don't hear that every day. Amazingly, it works, but only if you haven't seen the trailer. Yes, the fuckwit marketers have done it again - ruined the film by putting in the trailer the very parts that you don't want to see coming. It's based on a true story, apparently. Here, German Anneliese Michel becomes American Emily Rose. Both died during an attempted exorcism and resulted in the prosecution of the presiding vicar. The court case is told with accompanying flashbacks, showing Emily's deteriorating condition and subsequent treatment. Throughout the movie until the very end, we are left to make up our own minds about whether Emily was possessed or mentally ill. The schizophrenic nature of the film, jumping back and forth between legal and demonic scenes, is remarkably effective, magnifying the chilling aspects far beyond any straight horror movie. Two or three moments are exceptionally scary - I'd go as far as to say they affected me as much as any movie I've ever seen - but stupidly, they're the exact moments that are shown on the trailer. Because the trailer doesn't have the benefit of the suspense build-up, they're ineffective, and of course once you've seen them in the trailer, they don't work within the main movie any more. So, if you like to be scared by movies, DON'T WATCH THE TRAILER! Seriously, it'll completely ruin it if you do. I'm not exaggerating. 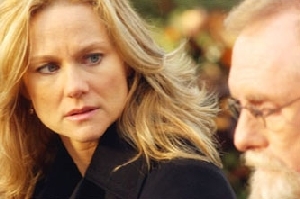 Laura Linney, from Love Actually and Kinsey, is the defending lawyer and gives a fine sceptical performance. Tom Wilkinson is typically weighty as the devout exorciser, though I would prefer it if he didn't have to pretend to be American. Relative newcomer Jennifer Carpenter dials in spookiness and vulnerability in equal measure, making a practically perfect potential possessee Emily. The director Scott Derrickson, also new to me, skilfully weaves his team's performances with his obvious talent for suspense to create an immensely powerful movie that will get to all but the most hardened viewer. If you're into scary movies and are bored with the regular empty tosh, give it a try before reading any other reviews or learning any more about what happens. Personally, I don't like being scared by something as harmless as a movie so I can't say I enjoyed it, but as another horde of potential vomiters pays to experience the latest fairground ride, it seems I'm in the minority. You won't find scarier than this in 2005. The Exorcism of Emily Rose is a startlingly effective movie. Unexpectedly, the courtroom scenes make the flashbacks far more effective by adding weight, and the technique will undoubtedly spawn many imitators. If you like scary movies, this is your nirvana - if you don't, closing your eyes won't be enough to keep the demons out. Testosterone Satisfaction Rating: 1/5 - just the scary bits. To enjoy this film you should be: willing to be scared. The Exorcism of Emily Rose is released in the UK on 25th November.